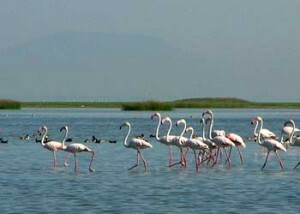 Nestling in the heart of coastal Orissa, Chilika lake is India’s biggest inland lake spread over 1,100 sq. km, it runs along the boarder of three district of Puri, Khurda and Ganjam and finally joins the Bay of Bengal through a narrow mouth, forming an enormous lagoon of brackish water. Dotted with many emerald green islands with colourful names such as Honeymoon Island and Breakfast Island, Chilika is home to a rich variety of aquatic fauna. It is also a sanctuary and winter resort for migratory birds, some coming from as far as Siberia. Containing a large variety of fish, the lake provides livelihood to thousand of fishermen. Hundreds of boats sail out daily on the lake’s blue expanse of mackerel, prawn and crabs-the sight providing an inside into the pageant of ruler India at its colourful best. Encircled by hills all along arched shaped shores Chilika lake colour changes with passing clouds and the shifting sun. The water ripples languidly, occasionally dancing with the gentle breeze from across the Bay of Bengal. Nalabana: An asylum for long-range migrant in winter. Bird’s Island: A heaven for resident and migratory birds. Kalijai: Abode of the inland Goddess ‘Kalijai’. Satapada: An ideal place for viewing cavorting Dolphins. Brahmapura: A place of scenic beauty. Parikud & Malud: Colourful inland within the lake. Nirmala Jhar: Nirmala Jhar is situated 11 km from Rambha and 21 km from Barkul. A place for religious worship as well as a picnic spot of great interest. Narayani: Narayani is situated 10 km from Barkul and 22 km from Rambha. By the side of a perennial stream, the shrine of Goddess Narayani adorns the place. It is also an ideal place for pleasure and relaxation. Banpur: Banpur is situated 13 km from Barkul and 8 km from Balugaon. A centre of religious activities revolving around the time-honored shrine of Goddess Bhagabatia and Dakshya-Prajapati. This entry was posted in Chilika Lake, Orissa and tagged Chilika Lake, Chilika Lake Puri, Chilka Lake Orissa, puri to chilka. Bookmark the permalink.